The fossil record of birds is not extensive: the light, hollow bones of birds are not likely to survive as fossils. However, a growing number of unusually well-preserved fossil birds are contributing much to our understanding of bird evolution. The oldest known fossil unambiguously identified as a bird is still the dinosaur-like Archaeopteryx, from the Solnhofen Limestone of the Upper Jurassic of Germany. However, it was not the only bird of the time. Very recently, another bird of almost the same age was discovered in northeastern China, and named Confuciusornis (shown at left; click for a larger image); Confuciusornis resembles Archaeopteryx in having wing claws, but unlike Archaeopteryx and like modern birds, Confuciusornis lacked teeth. Other birds belonging to various lineages have been found in Cretaceous deposits of Asia, Europe, and North and South America. Knowledge of the Mesozoic fossil record of birds is rapidly growing: the number of known fossil birds from the Mesozoic doubled between 1990 and 1995. Our understanding of bird evolution is constantly changing as more fossils are found, and scientists still debate the classification of some of these Mesozoic fossils. Prominent and well-known Cretaceous bird taxa included the Enantiornithes, a fairly diverse group of birds, mostly flying forms; Hesperornithiformes, toothed birds which were mostly flightless swimmers; and Ichthyornithiformes, toothed flying birds that probably fed on fish. These taxa are extinct today, but by the close of the Cretaceous, representatives of several modern bird taxa were sharing the skies with these extinct birds. A birdwatcher 65 million years ago could have seen relatives of today's loons, geese and ducks, albatrosses and petrels, and gulls and shorebirds, and possibly other familiar birds as well. Modern birds continued to diversify through the Cenozoic. The Cenozoic bird fossil record consists largely of isolated bones (although some nearly complete skeletons have been recovered from certain localities). Suffice it to say that by the early Oligocene, 35 million years ago, most of the bird orders that we recognize today had appeared. Our hypothetical birdwatcher could have added to her lifelist relatives of today's fowls, doves, parrots, penguins, crows, owls, and songbirds, to name a few. Were she birdwatching in South America, however, she would have had to steer clear of the phororhachids -- flightless, fast-running predatory birds, some nearly three meters tall, armed with enormous beaks and claws. These birds were the dominant South American land carnivores for much of the Cenozoic; recently, phororhachid bones have been found in Florida, suggesting that phororhachids were not confined to South America. In North America and Europe, in the Eocene, members of a different family of birds, the Diatrymidae, resembled the phororhachids and probably had a similar lifestyle. Both of these bird families had reduced wings and could not fly, and looked something like living ratite birds -- ostriches, emus, rheas, and so on. However, phororhachids and diatryimds were not closely related to the ratites, but were closer to living cranes, rails, and coots. The paleontologist Sankar Chatterjee has recently described the fossil Protoavis, from Late Triassic deposits in Texas. Chatterjee claims that Protoavis is a true bird that is actually closer to modern birds than Archaeopteryx. If this is true, this would push the origin of birds back by about 80 million years. It would also show that the first birds lived at the same time as the earliest dinosaurs -- which could disprove or force modification of the standard hypothesis that birds are descended from the highly derived coelurosaurian dinosaurs, which are not known from the Triassic. This would require major rewriting of the evolutionary history of the birds and dinosaurs alike. Is Chatterjee right? One problem with Protoavis is that the bones were not found in an articulated skeleton, and had to be pieced together. In this situation, there is always the possibility of mixing up bones from different organisms. This has happened often enough in the past to make many paleontologists wary when discussing Protoavis. Dr. Kevin Padian of the UC Museum of Paleontology believes that Protoavis is probably a mixture of two or more different skeletons, and several other paleontologists concur in this interpretation. Other paleontologists accept Protoavis as a single organism but put its birdlike features down to convergent evolution: Protoavis might be an early dinosaur or other diapsid that had evolved some birdlike features but was not on the lineage leading directly to modern birds. Several other Triassic diapsids, including forms not directly related to the archosaurs, show some convergent features with birds. The true story of Protoavis will probably remain a controversial topic for paleontologists for quite some time. Get the scoop on the oldest known bird with a toothless beak, Confuciusornis. 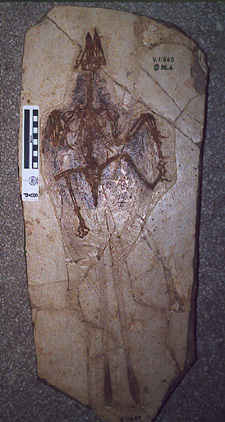 This and other articles on fossil birds are available from Jeff Poling's Dinosaur Homepage. Confuciusornis image by John R. Hutchinson. Chatterjee, S. 1995. The Triassic bird Protoavis. Archaeopteryx 13: 15-31. Chiappe, L.M. 1995. The first 85 million years of avian evolution. Nature 378: 349-355. Kurochkin, E.N. 1995. Synopsis of Mesozoic birds and early evolution of Class Aves. Archaeopteryx 13: 47-66.